The Men’s Health Negative Chinup/Dip Challenge is all the rage this week at Athletic Performance Training Center. The goal of this challenge is to do 1 negative dip and 1 negative chinup. Sounds simple enough, right? First, some background: Eccentric training, which involves focusing on the lowering (or, “negative”) phase of an exercise, can potentially trigger greater strength gains than concentric (lifting-focused) training, according to Ellington Darden, Ph.D. and author of The Body Fat Breakthrough. “Your muscles can handle more weight during the lowering phase,” Darden says. “And if you draw out that phase to a minute, as you will with the negative dip and negative chinup, you can recruit up to 40 percent more muscle fibers and enjoy a surge in muscle-building hormones.” The result: more power and strength in significantly less time. 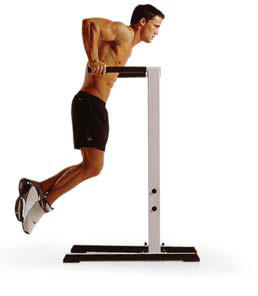 Grab the bars of a dip station and lift yourself so your arms are straight. Lean forward slightly and lower your body slowly — half an inch at a time — until your upper arms are below your elbows. The Challenge: You’ll be completing only two reps total (one per move), but they’ll probably be two of the hardest reps you’ve ever done. “Take one minute to lower yourself for each exercise, and rest two minutes between them,” says Darden. If you can’t last longer than 30 seconds, your eccentric strength needs a lot of work.